DADaPalooza: Win a BFG Trip to Great Britain! 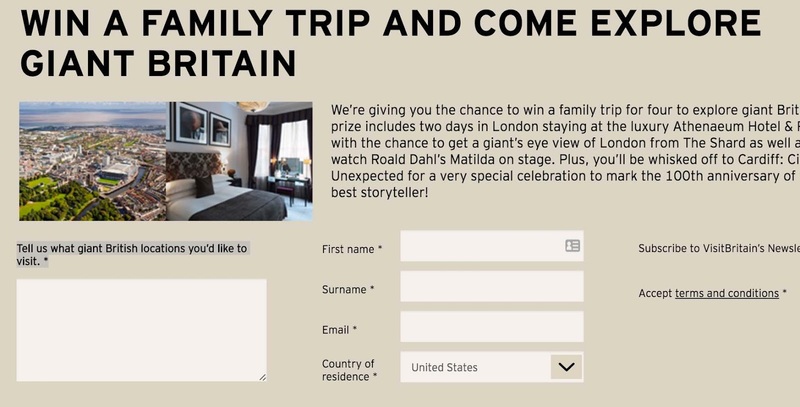 Win a BFG Trip to Great Britain! 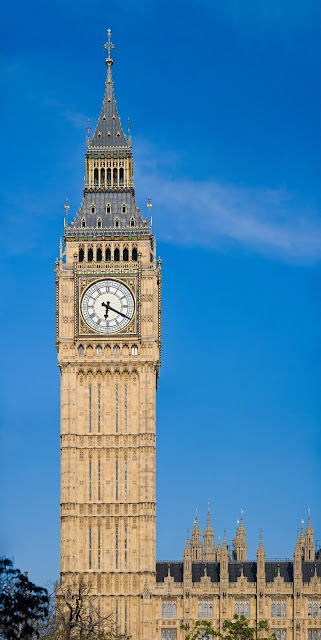 I was recently looking at Facebook, and found on my friend Jeff Bogle's of (OWTK) facebook page a cool link that he posted to win a trip to Great Britain, sponsored by VisitBritain. Especially with Brexit having just been voted on, this struck me as a lot of fun. And it comes with the opportunity to attend the Roald Dahl celebration in Wales. He's one of my favorite authors(for both kids and adult books), my son loved the BFG and Charlie and the Chocolate Factory (but was weirdly scared of the movie version of James and the Giant Peach) Anyway, Dahl is a favorite in this house, and I was intrigued. 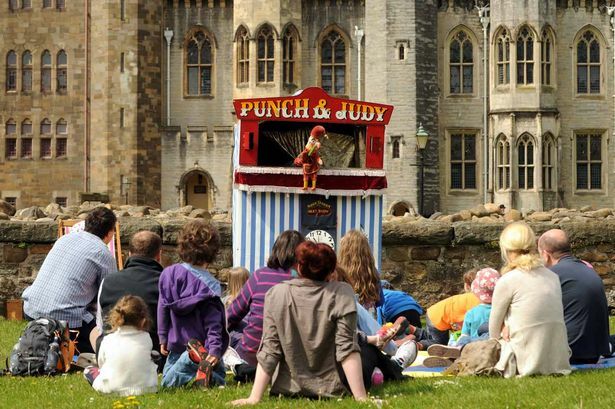 Punch and Judy show at Cardiff Castle. 6. This is a game of skill, and chance plays no part in determining the winner. Each entry will be individually judged based on originality, creative merit and humour of the answer provided. The judging will take place on or around 3 August 2016 at the Promoter’s premises and the winner will be the entry that scored the highest in the opinion of the judges based on the judging criteria. 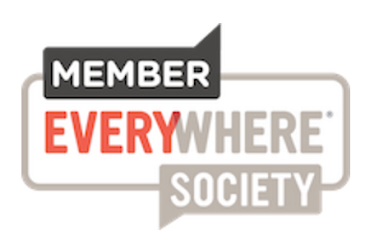 The judges may select additional reserve entries which they determine to be the next best and record them in order of merit in case of an invalid entry or ineligible entrant. Game of skill, eh? Most of these kinds of contests in the US are chance based. Challenge accepted! Big Ben, photo courtesy of wikipedia. While we are there we’ll have loads of fun. 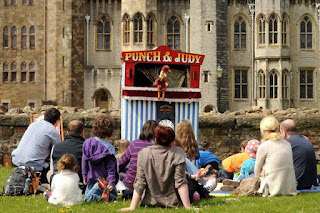 Watch Punch and Judy, laugh with glee. Listen to the sounds of the county fair. Stonehenge: ancient miracle or cosmic blunder? Visit a museum, see the Crown Jewels. Walk along the Thames, think of Shakespeare’s Fools. It’s almost time to end our trip, but that’s okay. We’ve had a blast, checking out Eng-land. Now all we have to do is win, wouldn’t that be grand? Okay, so I'm not the best poet in the world, but it's got a rhyme scheme, it's got some humor, it mostly scans, and it was quick! 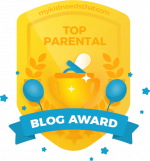 So I submit it, but there's an error-- it tells me that it has to be less than 140 characters! Yikes-- I just spent like an hour between writing the sonnet, and then changing it to this doggerel. Undaunted, I pared it down to the size of a tweet and entered. Oh yes, and here's the BFG Trailer, if you are interested.